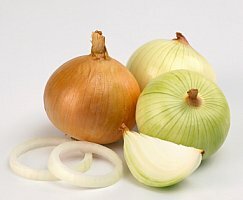 Onion facts, an information sheet for kids cooking activities. Onion facts and general information about onions. Onion bulbs grow underground and the green tops above ground. Various varieties are available but look for onions that are firm and not soft when pressed. Store in a dark, dry place. If grown in abundance, they can be stored bunched together in a well ventilated place. Chop onions, sauté and add for flavor in most dishes. Try a food chopper for less mess and tears. Cut the bottom of the onion off and place the onion top in a dish with a small amount of water. Continue to add a small amount of water as needed and within a few days or a week you'll see your onion top start to sprout. Onions have phytochemicals that helps prevent cancers and keep you healthy. Combine pancake mix, corn meal and milk. Beat until smooth. Slice onion, separate into rings. Dip in batter, coating well. Deep fry at 375 degrees (using a thermometer) for 2 minutes. Preheat a grill for medium-low heat. Cut a sheet of aluminum foil to about 12x15 inches. Arrange the green onions side by side in the center of the foil sheet. Sprinkle the onions evenly with the garlic, salt, and pepper. Arrange butter over the onions. Keeping the green onions flat, fold the foil to make a sealed cooking pouch. Place the foil packet on the preheated grill away from the main heat source. 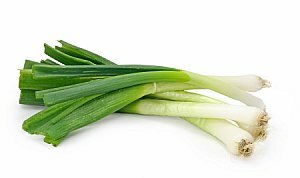 Allow the green onions to steam 5 to 7 minutes. Make sure your kids are old enough to use a knife if attempting to try this at home. Back to Food Facts from Onion Facts.